VIZIO, who set their store by making excellent TVs, also dabble in producing speakers for said TVs. Their biggest area of expertise is in surround soundbars - I.e soundbars with multiple included speakers. Over the past year, we’ve tested two of them: the SB3851, which we weren’t wild about, and the SB4051, a longer version. That’s the one we’re reviewing here - but can it do better than its smaller cousin? In this review, we break down the SB4051’s design, setup, sound, packaging and accessories, specifications and more, as well as how it compares to other models. You can also check out our video review. Before we get to speaking about the VIZIO SB4051, it’s probably worth talking a little bit about its predecessor, which we tested earlier this year. That would be the slightly shorter SB3851 – as you will have realised if you are even remotely awake, that bar is 38” long, while the model under review here is 40” long. You can read our full thoughts on the smaller model here, but if you need a TL;DR, we thought that while the accessories, setup, usability and design were all excellent, there were some definite issues with the sound. Overall, it was okay, but the bass – put out by a distinctly unimpressive subwoofer – left a lot to be desired. If the bigger version was going to impress us, that’s the first thing it had to rectify, and it did that before we even plugged it in. While the previous subwoofer was a weedy little box, the thing that comes out of the 4051’s packaging is an absolute beast. It’s a huge slab of a thing, designed to either sit up right next to your couch, or flat underneath it. We opted to position it standing up, and screwing in the included feet was simplicity itself, although you will need to supply a starhead screwdriver to get the job done. Outside of that, the only major difference between this model and the previous one, in terms of design and functionality, was the added length of the bar. While we feel like those extra two inches definitely make a little bit of a difference, in terms of sound, for the most part it’s a purely cosmetic change. You still get the same slim, good-looking bar, with the company logo prominently displayed at either end. And all the things we really did like about the smaller model made it through to this one, including the discrete lights that indicate volume, and the well-designed, slightly rubbery buttons on top of the unit – although chances are, you’ll be using the included remote to get things the way you want them. It’s also one of the few soundbars in this range with an HDMI connection, which we were very pleased to see, as well as optical and coaxial connections. You also get twin satellite speakers, both of which are no larger than a soft drink can, and which are easy to squirrel away. You can also wall-mount them, if you like, using the included brackets. The idea with surround soundbars is that they do a decent impression of a full surround setup, offering three front speakers (included in the soundbar), the two surrounds, and the subwoofer to handle the lower frequencies. In this, the SB4051 succeeds, offering an easier alternative to wrangling multiple speakers. The design was the thing we love the most about the smaller model, and we feel like it’s been refined even further here. Big thumbs up from us. The moment you start introducing multiple speakers is the moment where you need to be very careful with how you write the instructions down for setting the map. In a weird way, this is doubly true of soundbars, which are usually bought by people who want a simple, easy way to get better movie sound. Fortunately, VIZIO knock it out the park on this one. You don’t need a manual. Seriously. Well, you may need it to do things like pairing the bar with the wireless subwoofer slab, but other than that, you could theoretically operate without it. Every single port is clearly labelled, every cable supplied, and it’s the work of moments to get everything connected and ready to go. We’ll talk about the accessories a little bit more detail below, but you get just about every cable you could possibly want in the comprehensive package, and color coding as well as smart labelling help make the entire process dead simple. The company may have struggled with sound in the past, but there’s no question that in terms of usability, they know exactly what they are doing. Now we come to the big question: has VIZIO managed to improve on the sound quality issues that dogged the smaller model? The answer is yes – in a big way. While the sound signature isn’t as exciting as detailed as other, slightly pricier soundbars, there is still a lot to love here. The low end, for one thing, is vastly improved by whatever they’ve got going on in the big slab, and it can be further improved with a little bit of careful positioning. The bass felt robust and clear, hardly ever overpowering, with the level of thump that we really enjoyed having around. It doesn’t reach as deep as some other subwoofers, only going down to around 50Hz (others commonly go down to around 25Hz, particularly in dedicated 5.1 speaker packages), but it really does get the job done, and in a very enjoyable way. In a way, we shouldn’t be surprised. Unorthodox thinking can often push audio in new and exciting directions, and when subwoofer manufacturers start playing around with shapes, good things happen. A perfect example are SVS and their PC-2000, a giant cylinder that puts out some of the best low-end we’ve ever heard. And while, as mentioned, you will need to play around with the slab to find your preferred spot, it does reward you for doing so. The rest of the sound was pretty impressive, too. Although not nearly as detailed as some other sub-$500 bars, like the Cambridge Audio TVB-2, it still doesn’t excellent job of communicating what’s happening. We really appreciated how clear the vocals were, particularly when things on-screen got very busy, and even in the quieter moments, the sound really impressed us. There was a solid amount of detail, and the two satellite speakers – while they would never be accused of blowing the windows off – handled the side content with aplomb. What’s also interesting is that, unlike many other soundbars in this price range, the SB4051 packs in a whole host of surround sound codecs. What this means is that it’ll be able to take content with a soundtrack recorded in things like Dolby Digital or DTS True Surround, among others, and translate it accurately into 5.1. While you are going to be getting advanced codecs Dolby Atmos or DTS:X here – there’s definitely no functionality to add height speakers – these features worked well when we tested them with relevant content. The bar also packs quite a few neat tricks in it, including the ability to stream your music with the VIZIO SmartCast app. It not only has Bluetooth, but Bluetooth aptX – high resolution version that allows you to extract the maximum data from your stream, resulting in smoother audio. So, bottom line? This one scored. The soundbar fixed the biggest problem we had with its predecessor, sharpened the overall output, and in general, managed to really impress us. This particular price range, it’s one of the best-sounding pieces of kit available. It’s a real challenge, we’d imagine, to design a package from multiple speakers, cables, instruction manuals, brackets, and remotes, all of which are different sizes and all of which need to be carefully squirrelled away. Fortunately, as we’ve already established, VIZIO are a company that think very deeply about these things, and as a result, the packaging for this soundbar is brilliant. There’s no extraneous packaging – no messing around with endless bits of polystyrene, or random bits of tape. Getting everything out of the box and onto your living room floor is simplicity itself. When you experience as many un-boxing sessions as we do, you come to appreciate when a company has gone the extra mile, and actually thought about how something should be unpacked. Getting the accessories, as well as the speakers, out of the box and available is the work of moments. And what accessories. There is an embarrassment of riches here – an absolutely staggering amount of stuff, meaning that you’ll be able to get set up and listening with no extra trips to Best Buy. You get cables: RCA-to-3.5mm, coaxial, HDMI, digital. You get two thin, ultra-long cables for the satellite speakers. You get a whole universe of brackets, screws and Velcro cable ties, none of which you have to use but all very nice to have. You get feet for the subwoofer slab. And you get one of the best remotes we’ve ever tested. It’s the same remote as on the SB3851, and it just crushes it. It requires no thought to use, and – with a little bit of assistance from the lights on the soundbar – manages to communicate everything you need with a single thin LCD menu. It’s a masterclass in how to design a decent remote – something which we wish folks like Benchmark, who make ultra high-end gear, would pay attention to. When we reviewed their brilliant DAC3 HGC converter, one of the things that let it down with the absolutely absurd remote. If only they’d stopped to pick up a soundbar from VIZIO. There are more expensive soundbars available. There are soundbars which offer far more detailed sound, even deeper bass, and quality which really can compete with some of the biggest names in high-end. But there are very few bars that offer as much for as little money. At the time of writing, the VIZIO SB4051 is around $430 - less if you buy it used. And we can’t think of any other bar, for under $500, that offers quite as much. There are very few bars that offer full surround functionality, and of the few that exist, none of them are this usable, this well-designed, or this well thought-out. Our biggest concern, going into this particular review, was whether or not the company had dealt with the issues that plagued the smaller version. They have. That makes this, for the price, a genuinely attractive product, and one we think you’ll get a lot of use out of. If you want to improve your TV sound, but you are quite ready to make the leap to full, independent 5.1 or 7.1, this offers one of the easiest and most enjoyable ways to do so. It’s also, to our knowledge, one of the least expensive 5.1 soundbar setups available, which is a big mark in its favor. Fixes the biggest problems we had with the previous model. Does a decent impression of surround sound, but can’t quite compete with dedicated systems. Other bars offer slightly more detail. One of the few surround soundbar packages that are cheaper than the SB4051, this collection from Samsung will get the job done – if you’re prepared to sacrifice audio accuracy. 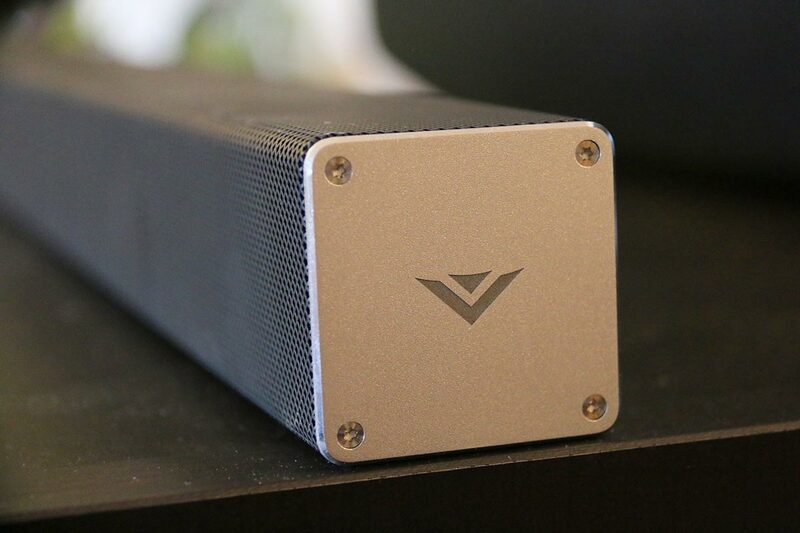 The sound quality is passable, but definitely not as engaging or dynamic as the VIZIO bar. However, if your budget isn’t quite up to $400 and up, and you just want some surround audio in a small space, then this could be the one for you. Now we’re talking. This surround collection of speakers is a little more expensive than the SB4051, arguably offers better audio quality, as well as excellent design. It’s not quite as human or as personable, to be sure, but this is JBL we’re talking about: they know their stuff when it comes to audio, and the reproduction here is very good indeed. It must be said that we still prefer the VIZIO for the overall experience, but this is an excellent alternative. If you want something a little more accurate, and are prepared to forego surround sound, then look very strongly at this model from Cambridge Audio. Compared to the SB4051, it’s slightly more expensive, and doesn’t offer bass that is quite as powerful. However, what it does offer is unbelievable audio accuracy, a hugely impressive soundstage, especially given that it doesn’t have surround speakers, and some great detail. If your tastes via more towards that than surround reproduction, look no further. VIZIO SB4051 $430 Unknown 5.1 2/0 Yes Yes 40"
Samsung HT-J4500 $220 500 5.1 0/1 Yes Yes 16"
JBL Bar 5.1 $699 510 5.1 3/1 Yes Yes 45"
Cambridge Audio TVB2 $279 Unknown Unknown 1/1 Yes Yes 34.6"